To display text based on another cell, you have to use the conditional function IF. 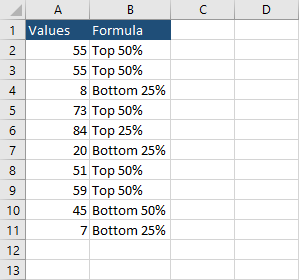 The function displays the value in the first argument (“Bottom 50%”) if the condition is met, otherwise it displays the text “Top 50%”. Now our function will look like this. As you can see, it becomes really complicated even for such a low number of conditions. Instead of using this way to create a formula for more conditions, you can create a function in VBA that will display the desired text. To do this we are going to use a function with the Select … Case statement. The function will take one parameter, which is a reference to a cell. Create a new module and enter the following formula. CheckValue = "Not in range"
Type =CheckValue(A2) into cell B2 and autofill for the rest of the cells in the column. This is a great way to write such functions because it’s more readable and can be easily modified.